I had already found empirically that exploiting eyes and vision can, and does, help a lot with movement issues in Parkinson's Disease. In particular, I had realized that using visual cues, such as cracks in the pavement, allows us to access motion in situations where such movements would be otherwise impossible due to the disease. Moreover, by consistent and persistent practice of increased movement using such visual "tricks", I found that I could increasingly access wider ranges of motion, even without the cues. A good example comes from my research results on re-learning walking using patterns on the floor, which I demonstrate in the first video embedded below (from August 2016). The second video is from a year a later, and I hope the viewer can see very significant improvement in my gait after months of consistent practice at walking with the aid of patterns on the floor. In the next video, I demonstrate how, by using a lamp shade above my head as the visual cue, this allows me to raise my arms up above my head while holding "Smovey Ring" therapy devices. Swinging these back and forth is really helping me to increasingly unlock my shoulders and neck. Again, the important point here is that I would not even have been able to initiate these arm swinging exercises, without the overhead visual cue, as my access to movement was not sufficient at the time of recording to raise my arms without the assistance of vision. SMOVEY RINGS AND APPLICATIONS FOR PARKINSON'S DISEASE. I have taken the idea of using the stepping stones on the patio and ran with it. I sourced and bought some interlocking play mat tiles from amazon. The colors and patterns that can be made with these take my original idea above and expand into almost unlimited ways to help with regain walking ability and balance too. They also have pragmatic applications, for example creating "runway" strips through the house, preventing falls by helping to regulate steps as people with Parkinson's move around, or as visual aids to recover from freezing episodes in doorways. I've personally found these tiles very beneficial for re-learning how to walk and improving balance, and, indeed, their use really underlined the importance of visual cues to me in movement therapies. Just by having these on the floor really unlocked my ability to lift and move my feet and allowed me to take almost normal steps. They can be made into temporary pathways, indoors or out, or scattered into "stepping stones". . By separating the tiles further and further apart or stepping over more than one tile at a time, I could gradually stretch out the size of the step. Advanced versions of the therapy involve making them into "hop scotch" type games where one hops or jumps from tiles to tiles. Placing them in circles and walking round and round the circle, first in one direction and then the next, can be quite stress relieving and helps stimulate the vestibular system (sense of balance). The different colors provide some visual color therapy too, which can even be incorporated into voice recovery programmes, for example by calling out the colour of the tile as loud as possible as one steps onto it. Even more challenging for the brain is calling out the opposite colour, e.g. "red" when one steps on a blue tile. More color/visual games, which help alleviate stress, can be made just by sitting in the lotus position and creating patterns in front or around you, using the tiles as the big jigsaw pieces they are, or sorting them back into stacks of different colours. These "games" or exercises which exploit the tiles as colorful visual cues, when undertaken in an "off" state (as symptoms are returning after a dose of the PD drugs has worn off) can not only help applied neuroplasticity, but also to pass the time until the next does of medication kicks in again. Indeed, the distraction factor can be stress relieving in itself, and the meditative nature of these games can actually encourage the medication to work as it puts the Nervous System into a relaxed state and prevents anxious thoughts. A note of caution: beware of latex allergy with these type of interventions - I have found that allergies for people with PD can actually manifest as worsened symptoms, especially pain and rigidity! 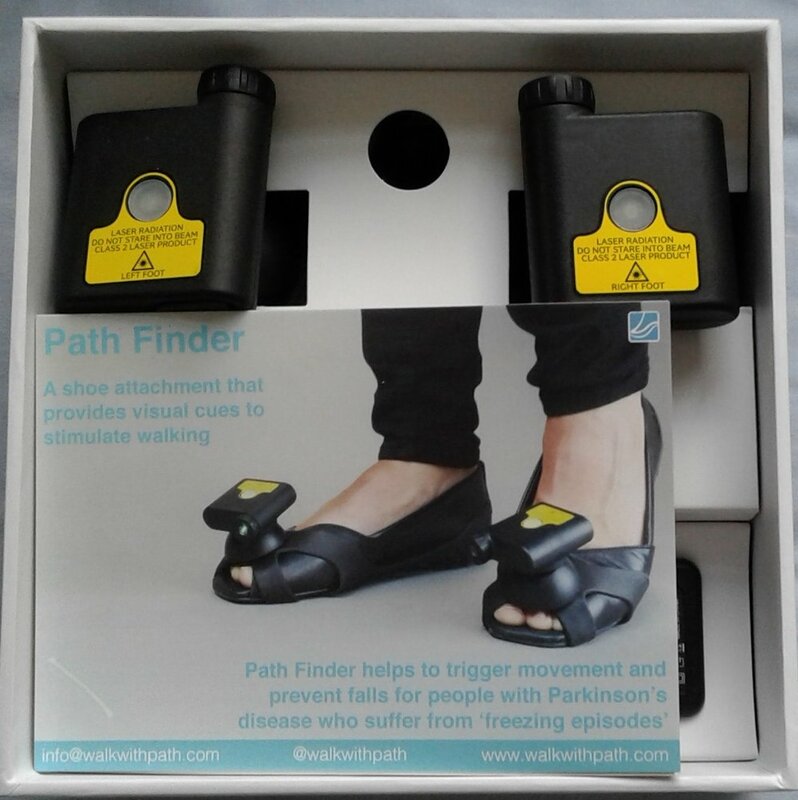 Recently, these idea has been taken forward via an interesting new technology which is now available on the market, the "Path Finder" product from Walk With Path. The technology consists of laser beams which are attached to shoes and which shine a green line of light onto the floor. The device on the left foot shines in front of the right foot and the one on the right shines in front of the left. In other words, the visual cues for walking move with the feet via this very clever idea. I was very pleased to have been sent a unit to try myself as part of Out-Thinking Parkinson's research. I did find this idea works quite well in general, it took me about just fifteen minutes of practice while symptomatic (when I would otherwise default to the PD shuffling gait) in order to get into the swing of it and work out how to walk around properly using the visual cues it provides, but it soon became easy. After another fifteen minutes of mindfully using the devices to walk around (by the way, I found that stepping over the line was much better than stepping onto it - actually easier, but also encouraging more of striding step), I was quite surprised after taking them off how shuffling my unassisted gait actually was. They were a little tricky to get on to the shoes and even more so to set the beams up properly - quite fiddly and a lot of trial and error to get the lines to be symmetric enough to ensure I wasn't favouring either leg. I did find that the beams could move slightly after a while and would need re-tuning. So these need setting up when the person with PD has access to movement, or the assistance of a care giver will be required. I feel the benefit of this concept however is in its inherent therapeutic value, as a re-training tool, rather than for practical (long term) assistance per se. The major application could be to open up initial access to walking again, albeit starting in a manner in which one still has to look down, and also keep one foot on the floor at all times. Longer term, looking up while walking, as naturally and as quickly a possible should be the goal. Indeed, several people have famously reported "walking off" their Parkinson's Disease with persistent practice of mindful fast walking over the timescale of a year or so. Thus I believe that the technological solution's principal value is it provides the key to the start of unlocking walking again. With consistent, persistent practice daily stepping with the aid of the visual cues it provides, I strongly believe, and have experienced through long term use of simpler versions of such cues myself, that this may eventually help people with PD to begin to access forced faster walking, which is known to seriously help with progressive symptom reduction.